Whether you are adding a new seawall, replacing or repairing an existing wall, Overbeck Marine Construction can provide you with the solution that fits your needs. We offer the highest quality materials and construction techniques from interlocking vinyl or composite panels to traditional pressure treated wood. Our wooden seawalls are constructed from 2.50 CCA pressure treated lumber. They are cost effective, long-lasting, resistant to salt water and have a nautical look. Shown above, vinyl seawalls are impervious to salt water, UV resistant, corrosion resistant and virtually maintenance free. Several colors are available to match your home environment. Depending on your geographic location & existing regulations, Overbeck Marine Construction can custom design your deck or dock in a variety of shapes & sizes. 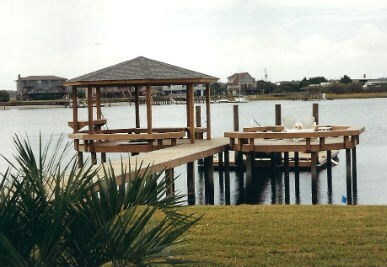 We will help you maximize your valuable dock space while accommodating your budget & taste. Overbeck Marine Construction offers quality, reliable and affordable boat lifts to meet your needs. A dependable boat lift makes launching and storage of your boat safer and more convenient. Remote up/down, leveling and limit switches are available.